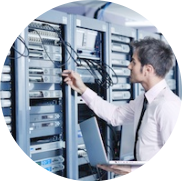 Computer network is an essential part for the operation of each information system. Design of the network is very extensive and complex business, which requires primarily good planning, taking into account all user requirements. Before proceeding to execution of works on the installation of cables and other equipment, it is necessary to detail an elaborate network project. High-quality project will contribute to choosing an optimal solution that will best suit the needs and capabilities of the user. 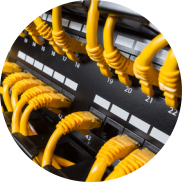 We are able to offer a choice of all available technologies for LAN and WAN network, and to cooperate with you so that you can choose the best option for your requirements. We can produce all types of computer and communications networks. 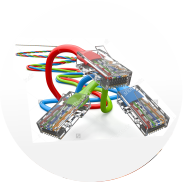 We can also implement structured cabling systems based on UTP, FTP, STP cables. Using 5E, 6 and 7 categories of passive components, we are able to achieve the actual network protocols (10/100/1000 Mb/s). If necessary, we can implement fiber optic cables and wireless equipment.